Latest IDC research findings revealed that Russia has overtaken UK and Brazil to emerge as the third largest market for ebooks in the world, behind only the US and China who dominate the top two slots respectively. eBooks have hit a steep popularity curve in Russia in the last few years with the growth rate pegged at 25 percent for the third quarter over the quarter before it. Sergei Anuriev, CEO of LitRes, the biggest retailer of ebooks in Russia, has some more insights of the domestic ebook market to share. eBook proliferation has reached an astounding 200 percent since 2011, and is estimated to reach 500 million rubles ($16.2 million USD). 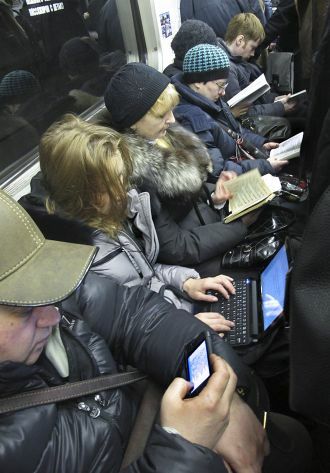 This will be about twice the 260 million rubles that the ebook market was estimated at in 2012. What is even more interesting is that ebooks still represent just one percent of the Russian ebook market which means there is still a tremendous scope for growth of ebooks in digital form in the country. The same is expected to rise to five percent by 2017, which will make the ebook market worth around RUB 3 billion (USD $90 million). Further studies have revealed that the majority of ebook purchases were made from Moscow and St. Petersburg with other regions lagging behind significantly. In another revelation, the majority of ebook purchases were made from traditional PCs with just 34 percent of purchases made from ereaders, tablets, or smartphones. Interestingly, dedicated e-reading devices have witnessed a steady decline in consumer interest. However, J’son & Partners Consulting would like us to believe that the ebook buying trend is expected to reverse by 2016 when 77 percent of ebook purchases are likely to be made from tablet or smartphone devices, while the remaining 23 percent from desktop or laptop devices. And: The story is nonsense: The Russian E-Book market is less than ONE TWENTIETH of the UK market!!! market in 2012, up from 8 per cent in 2011, and 5 per cent in 2010. The upward trend continued in 2013.